Below is a list of Acadia National Park's named peaks with notes and links to the trails that lead to the summit. 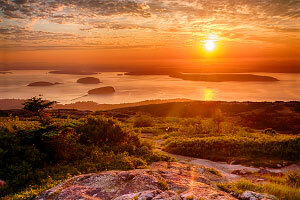 Most visitors to Acadia National Park are familiar with Cadillac Mountain, the tallest and most famous peak on Mt. Desert Island, but Acadia is sprinkled with dozens more beautiful peaks, each with multiple compelling trails that lead to the summits. While the elevations of Acadia's peaks may seem incredibly low compared to the mountains out west, these hikes can still be strenuous and exposed, and the views from the summits are still breathtaking, especially with the Atlantic Ocean or various lakes in the background far below. The next time you are back on Mt. Desert Island, try to tag as many summit markers as you can! Cadillac Mountain 1529 feet The highest peak in Acadia is a very popular spot for sunrise and sunset and is the only summit in Acadia that you can drive to the top of. 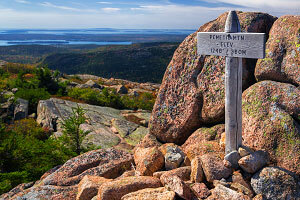 A nice and easy hike at top is the Cadillac Mountain Summit Loop. Several longer hikes up from the bottom to the summit include the Gorge Path, the Cadillac South Ridge Trail, Cadillac North Ridge Trail, and the Cadillac West Face Trail. Sargent Mountain 1373 feet Acadia's second highest peak is located due west of Cadillac Mountain across Eagle Lake and Bubble Pond, with numerous hiking routes leading to the top, including the Sargent South Ridge Trail, the Sargent East Cliffs Trail, the Grandgent Trail, the Hadlock Brook Trail, and the Maple Spring Trail. Dorr Mountain 1270 feet Located just east of its larger companion Cadillac Mountain, Dorr Mountain also has trails to the summit from all directions of the compass, including the Dorr East Face Trails (Emery Path, Homans Path, Kurt Diedericht's Climb), Ladder Trail/Schiff Path, Dorr South Ridge Trail, and the Dorr North Ridge Trail. Pemetic Mountain 1248 feet The towering and majestic peak sandwiched between Jordan Pond and Bubble Pond. Access via the Pemetic South Ridge Trail, Pemetic North Ridge Trail and the steep and intimidating Pemetic Northwest Trail. Penobscot Mountain 1194 feet Formerly known as "Jordan Mountain", this majestic peak has wonderful views and wonderous granite formations. Access via Spring Trail/Penobscot Mountain Trail and alternatively, the exposed and thrilling Jordan Cliffs Trail. Bernard Mountain 1071 feet The tallest peak of the Western Mountain pantheon on the "quiet side" of Mt. Desert Island. Access via the Bernard Mountain Trail, Sluiceway Trail, and alternate start up the West Ledge Trail. Champlain Mountain 1058 feet One of the easternmost peaks on Mt. Desert Island, located along the Park Loop Road north of Sand Beach. Trails lead to the top from all directions of the compass: the famous and intimidating Precipice Trail, the Champlain South Ridge Trail, the Champlain North Ridge Trail, and the Beachcroft Path. Gilmore Peak 1036 feet A small peak compared to its imposing neighbor, Sargent Mountain, this often overlooked peak offers some great views. Access via a Bald Peak, Parkman Mountain, Gilmore Peak hike or also the Giant Slide Trail loop hike. Bald Peak 974 feet A wonderful little peak that offers up some great views. 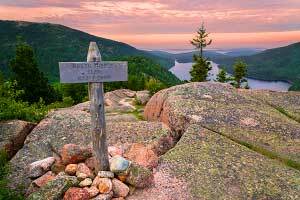 Access via a Bald Peak, Parkman Mountain, Gilmore Peak hike; tag three peaks in one hike! Mansell Mountain 949 feet The other major peak of the Western Mountain pantheon, a plethora of trails lead to the summit, including the Perpendicular Trail, the Mansell Mountain Trail, and the Razorback Trail. Cedar Swamp Mountain 942 feet Tucked away in the "Middle Peaks" area, this mountain offers wonderful views of the "amphitheater" to the southeast. Access via the long and wandering Sargent South Ridge Trail. Knight Nubble 930 feet A small forested companion peak to the larger Bernard Mountain in the Western Mountain pantheon. Access via the Bernard Mountain Trail, the nearby Razorback Trail, or the Great Notch Trail. Parkman Mountain 941 feet Formerly known as "Little Brown Mountain," this is a wonderful little peak that offers up some great views. 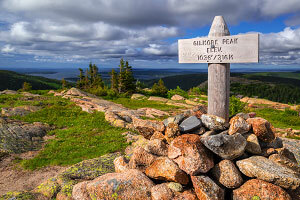 Access via a Bald Peak, Parkman Mountain, Gilmore Peak hike; tag three peaks in one hike! North Bubble 872 feet The taller of the two "Bubbles" (North and South) as seen from the Jordan Pond House, the view of Jordan Pond from the summit is spectacular. Access via the North Bubble Trail. Norumbega Mountain 852 feet A relatively isolated peak sitting on the east shore of Somes Sound. Access via the "Goat Trail" or the connected Norumbega Mountain Trail. Beech Mountain 839 feet Located in the heart of the "quiet side" between Long Pond and Echo Lake, Beech Mountain is famous for the fire tower at its summit. Several routes lead to the top, including the Beech Mountain Loop trails, the Valley Trail/Beech Mountain South Ridge Trails, and the more remote West Ridge Trail. South Bubble 768 feet The shorter and closer of the two "Bubbles" (North and South) as seen from the Jordan Pond House. Home to the famous "Bubble Rock" balancing at a cliff's edge. Access via the South Bubble Trail. Huguenot Head 731 feet Formerly named "Picket Mountain," this is a companion peak to the larger Champlain Mountain. Access via the Beachcroft Path, although the trail doesn't go over the summit. McFarland Mountain 724 feet Located northwest of Eagle Lake; no maintained trail leads to the top. The Triad 698 feet This peak with three high points is located south of Pemetic Mountain and north of Day Mountain. Hiking options include a Day Mountain Trail/Triad Trail loop and an approach via the remote Hunters Brook Trail. Acadia Mountain 681 feet Acadia's namesake peak and oddly enough, the only peak on Mt. Desert Island that runs east-west rather than north-south. 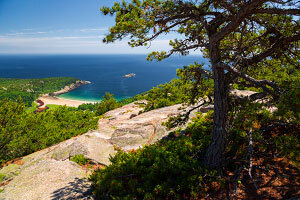 Access via the Acadia Mountain Trail, this is one of the most popular and scenic hikes on the "quiet side". Youngs Mountain 680 feet Located northwest of Eagle Lake; no maintained trail leads to the top. St. Sauveur Mountain 679 feet Formerly known as "Dog Mountain" and located just south of Acadia Mountain on the "quiet side" of Mt. Desert Island, access is via the St. Sauveur Mountain Trail. Conners Nubble 588 feet A minor peak just north of North Bubble, this summit offers wonderful views looking down at Eagle Lake. Access via the North Bubble Trail. Day Mountain 583 feet A minor peak on the south side of Mt. Desert Island near Seal Harbor. Access via the Day Mountain Trail. This is also the only peak you can bike to the top of via carriage road. Valley Peak 530 feet Perhaps it could be considered merely an extension of St. Sauveur Mountain's southern ridge, but Valley Peak offers wonderful views down onto Somes Sound. 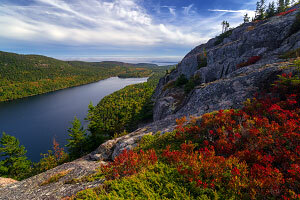 Access via a St. Sauveur Mountain loop hike or a longer Flying Mountain/Valley Peak loop hike. Gorham Mountain 525 feet A small peak located right next to Ocean Path that offers terrific views of the Atlantic Ocean. Access from the north and south via the Gorham Mountain Trail. The Beehive 520 feet While one of the shortest named peaks in Acadia, this mountain is steep and photogenic! Access via the thrilling Beehive Trail iron rung route or from the back side via the milder Bowl Trail. Jerusalem Mountain 472 feet A minor peak located in the heart of Isle au Haut. Access is via the Bowditch Trail, but you might not even notice that you summited this forested hill. Brewer Mountain 444 feet Located north of Eagle Lake; no maintained trail leads to the top. Schoodic Head 435 feet Located in the Schoodic Peninsula section on the mainland, Schoodic Head is the forested high point of the area. 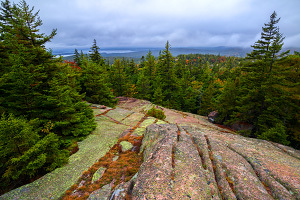 Several trails make their way to the summit: Schoodic Head Trail, Anvil Trail, and the East Trail. Kebo Mountain 407 feet A very minor peak that is the extension of the Dorr Mountain north ridge. Access via the Kebo Mountain/Dorr North Ridge Trails. Bald Mountain 405 feet Not quite a mountain and not to be confused with the taller Bald Peak, Bald Mountain is part of the southwest ridge of Bernard Mountain on the quiet side of Mount Desert Island. Access via the Bernard Mountain West Ledge Trail. Bowditch Mountain 405 feet A minor peak located in the heart of Isle au Haut. Access is via the Bowditch Trail, but you might not even notice that you summited this forested hill. Duck Harbor Mountain 314 feet A minor peak located near the southern end of Isle au Haut that offers good views of Western Head. Access via the Duck Harbor Mountain Trail. Flying Mountain 284 feet Credited as the shortest named peak in Acadia, a short hike along the Flying Mountain Trail leads to a beautiful view above Somes Sound. Great Head 145 feet Located just east of Sand Beach, this seaside high point isn't really a peak, but it does have its own summit elevation marker. Access via Sand Beach and the Great Head Trail.